You'll not find a tougher Octopus toy out there! And you'd be hard pressed to find ANY soft toy that can fend off dog teeth like Oscar. 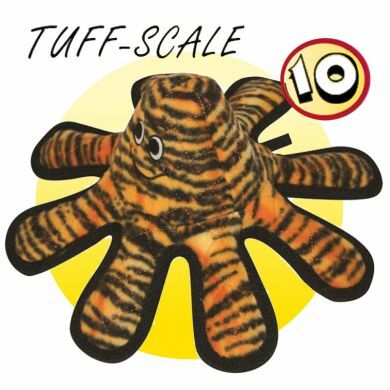 This mega Tuffy toy is one of the strongest most durable soft toy. Rated 10/10 for toughness! The mega Tuffy range has been tested on many different types of dogs - as well as tigers! What's great about Oscar the Octopus? Read 4 customer reviews of Tuffy Toys Oscar Octopus. The average customer rating is 4. My 2 staffies were so excited to get their new toys, they run amok with them as soon as they got them. Even though they are rated 10, they still only lasted a week with them. Unfortunately, the stuffing was all over the patio within a week and some of the squeekers have been removed. No problems with the product, just staffies that will not allow anything to last longer than a week. Hope it was a fun week for them though! Our great dane, Maverick, loves his new Oscar the Octopus toy. Each leg has a squeeker in it that he has tried chew out, but it has held up well so far! Very tough indeed but there is a trade-off for toughness - lack of softness. Our dog plays with it a little bit but still prefers softer toys. It is hard to find the balance between softness and durability. I rated it low due to the lack of interest from our soft toy loving labrador!